Chris Rogers is a throwback. A craggy, no-frills batsman who makes runs unobtrusively but incessantly using all his 37 years experience to eke out an existence. He shuffles about the crease and steers the ball into space with stiff, inelegant movements. There is no machismo about his play. He forces the bowlers to work for his wicket. He proved both to his teammates and to England that success on this slightly unpredictable pitch was possible if you waited for the right ball to hit. But no one else on his side took the hint. 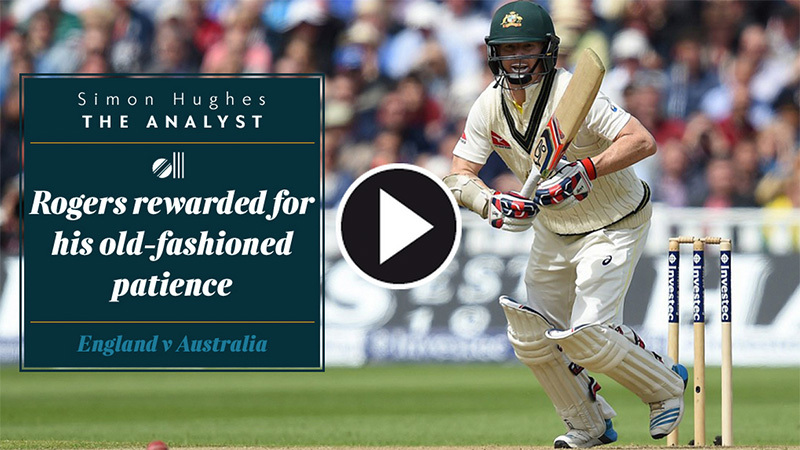 Apart from Rogers, Australia’s batting was diabolical. The bespectacled Rogers has spent 20 years doing a sort of doctorate in batting, more than half of it in England where there is the richest diversity of conditions. Seeking a full batting education, he played club cricket in Devon and the Midlands before spells with four different counties – Derbyshire, Leicestershire, Northants and most recently Middlesex. Perhaps that is why he seems most un-Australian both in his play and in his manner – he is eternally polite and still applauds opposing batsmen when they reach significant milestones. He was determined to be passed fit for this match – after the recent complications associated with his blow on the head – because he knows how essential he is to this team here. He is the Australian best equipped to deal with English conditions. He would have realised after the first ball of the match – from Jimmy Anderson – which zipped past his outside edge and soared into Jos Buttler’s gloves, that the situation would demand all his hard-earned expertise. This involved getting into position early and playing the ball as late as you dared. Edgbaston – often a capricious surface, on day one especially – rewards patience and punishes extravagance. Batsmen who go in search of runs will donate wickets. You must let the ball come to you. It is a surface for gatherers not hunters. Rogers did that expertly. He took guard deep in his crease, and remained on the backfoot looking to dab and glide and deflect the ball with pushes and punches. One sliced drive when a delivery wasn’t quite as full as he expected, looped agonizingly over Ben Stokes head at cover. Otherwise, he was a model of restraint, leaving the ball judiciously, while also making sure that runs were scored and width was capitalized on. He knows a strokeless batsman is a sitting target. Like another prolific left hander – Kumar Sangakkara, a man Rogers greatly admires – he confounds the accepted wisdom that you must hit straight on seaming pitches. Instead he allows his hands and feet to go with the movement, steering the outswinger square of the wicket, riding the movement, placing it carefully into gaps, using the pace already provided. Looking unflustered despite the wreckage occurring around him, Rogers continued dabbing and deflecting runs, and 45 not out, had exactly half the Australian total. When he had made fifty he had continued his exceptional run of nine half centuries in 10 completed innings, and was only prized out by an mischevious delivery from Broad which turned an unexpected corner from round the wicket and trapped him lbw. He has now made 369 runs in the series, average 90. Steve Smith’s 214 at Lord’s overshadowed Rogers 173. Unobtrusive you see. He is nicknamed Bucky after Buck Rogers from the 1947 American comic-book superhero. And after this calamitous mess they have landed themselves in, the Australians may need one to escape. And English lead of 150 will be crippling.